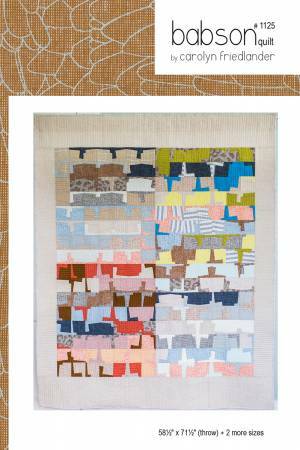 Babson Quilt Pattern is a modern, foundation paper-pieced project that can be made up in a variety of ways and styles. The pattern uses charm squares, fat quarters and/or yardage, making it pre-cut friendly and easy to kit. Three project sizes (wall, baby, and throw) can be made up using many fabrics or just a few, which means it caters to a range of creative tastes and styles. The speedy, beginner-friendly blocks are great for classes, fussy cutting and all sorts of fabric and color play.